It doesn't take much to set yourself up for 15 minutes of fame anymore. All you need to do is have a memorable moment on a reality show, or strategically pose in the background of celebrity photos or... start randomly yodeling in Walmart. Or, you could foolishly risk your life attempting to pull off an epic stunt (not recommended), which is what a dude with a death wish did when he jumped off an 11th floor balcony of a cruise ship as his friends filmed him. nearly died, and promptly got banned by the company for life. While docked in the Bahamas on Royal Caribbean's Symphony of the Seas last week, 27-year-old Nick Naydev made the ill-advised decision to hop up on the railing of an 11th floor cabin balcony and into the water below, all while his pals were filming him. The idea was to presumably make a stir on social media, according to Naydev's pal Konstantin Kryachun, who filmed the stunt, per a report from Yahoo! Lifestyle. “He’s jumped from those kind of heights before, and we didn’t really care about the consequences with the cruise company,” Kryachun explained in an Instagram post that's since been deleted. “We just wanted to get a video of it and make it go viral." And while their goal has been vaguely achieved since the video's racked up some 100,000-plus views in the last six days, Naydev nearly killed himself in the process, and earned himself a lifetime ban from Royal Caribbean. However, several of the commenters were quick to call him out for such an idiotic and dangerous move, reminding him just how easily he could have killed himself free-falling from a height of 110 or 120 feet like that. Naydev's time spent in the water overboard was brief. He was quickly picked up by a small boat and returned to the ship by police who let him collect his things before booting him from the ship, while his friends were subsequently interrogated and also kicked off. 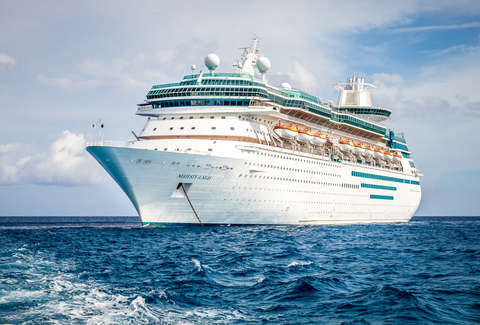 Representatives for Royal Caribbean summed up the company's feelings on the incident pretty succinctly, simply describing it as "stupid," per Yahoo!. They said that beyond banning Naydev, they're also exploring legal options. Dumb move, for sure, but it sounds like maybe he and 8Booth might make good vacation buds?